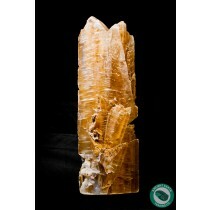 Cave of Crystals Cave of Swords Selenite Gypsum Crystals from Mexico For Sale - Ancient Earth Trading Co. In 1910 miners discovered a cavern beneath the Naica mine workings, the Cave of Swords (Spanish: Cueva de las Espadas). It is located at a depth of 120 m, above the Cave of Crystals, and contains spectacular, smaller (1 m long) crystals. It is speculated that at this level, transition temperatures may have fallen much more rapidly, leading to an end in the growth of the crystals.